SoilPlex™ is simply the best organic humic product available today that contains the highest concentrations of both humic and fulvic acids for healthy soils and plants. Unlike fertilizers, SoilPlex™ not only benefits the plant now, but also improves soil conditions over time to create sustainability. It is made from a naturally occurring humus that is rich in humified organic matter containing Humic and Fulvic acids, with the lowest impurity levels possible. The Humic source in SoilPlex is similar to the commonly found it Leonardite , HOWEVER our source contains a higher concentration of Humic substances and significantly lower levels of heavy metals, such as lead, arsenic, and mercury. As SoilPlex is processed using strict guidelines in insure the highest quality available. It is classed as a non-hazardous material and has the lowest toxicity values. SoilPlex may be used as a soil amendment, foliar spray or fertilizer enhancer. 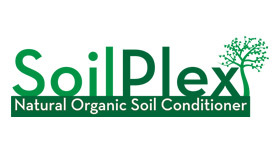 SoilPlex™ is ideal for use on all soils and plants under all conditions. The Humic and Fulvic acids in SoilPlex act as natural chelating agents binding to nutrients in the soil. Plant roots absorb these humic acid-nutrient compounds effectively increasing the efficiency of plants and decreasing nutrient losses caused by leaching. Being in liquid form, it is fast acting and highly effective at delivering humic acids deep into the soil and/ or to the plant. In combination with fertilization, it allows the end user to get the most out of their fertilization program and will reduce the amount of nutrients necessary produce healthy plants. SoilPlex will contribute to improving soil quality, texture, water holding capacity and sustainability, while aggregating soil reducing sodium build up.